Whenever it rains like it did today, all I want to do is curl up in bed, and lie around all day. Mimzy and I both agreed the rain warranted cooking comfort food. For some odd reason, Chinese food sounded comforting to me. I had to make dew what I had on hand because I didn't want to get soaked going to the grocery store. I scraped together a great meal consisting of Egg Drop Soup, Chicken Fried Rice, and Sesame Baked Kale. 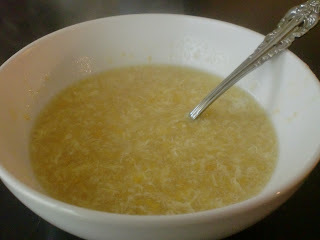 To say King Hock loves egg drop soup, is an understatement. He was ecstatic while he ate it tonight. It literally took 5 minutes to prepare, and is delicious. I had kale in the fridge because while grocery shopping with Prince Hock #1 last Friday, he saw kale and asked me to buy it. Seriously, how can you deny a child kale? He calls it kelt, even though I have corrected him many times. In a large pot, mix together the broth, the cream corn, and salt. Bring to a boil. In a small bowl mix together the cornstarch and cold water. Add to the boiling pot. Stirring. Add a little bit of the warm soup to the beaten egg. Then, drizzle the egg to the pot, while stirring the pot at the same time. The more you stir, the finer the egg pieces. King Hock likes the pieces bigger, so I stir a little bit. Serve with a pinch of scallions, and fresh cracked black pepper. There was a time in our lives when we had no children and we would eat at a hibachi restaurant 1 or 2 times a week. 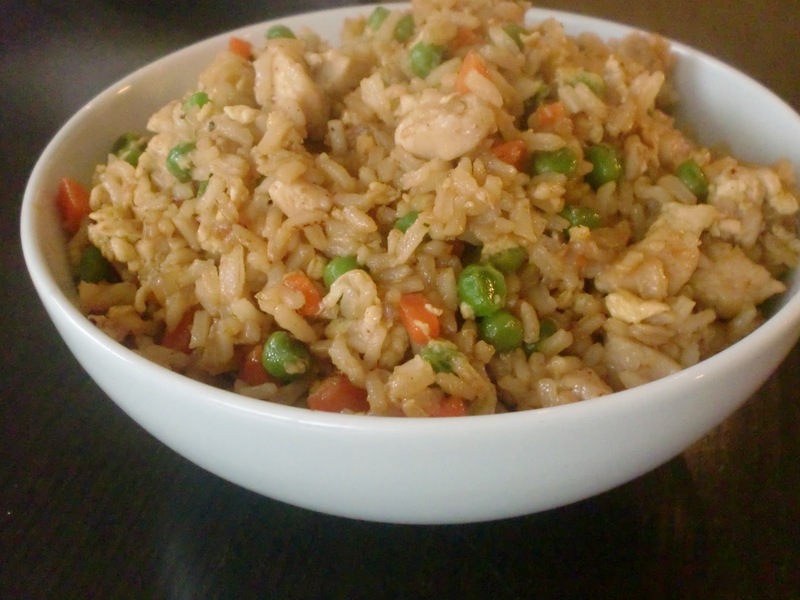 I learned to make authentic fried rice, watching the hibachi chefs time after time. In a large nonstick wok or skillet, heat the vegetable oil over medium high heat. Add the chicken and the onions, with a pinch of salt and pepper. Cook until the chicken is cooked through. Add the carrots and peas. Continue to cook for another 5 minutes. Add the egg, scrambling it with the other ingredients. Add the rice and mix all together. Add the margarine, soy sauce, teriyaki sauce, garlic powder, and sesame seeds. Continue mixing everything together for another 2 minutes. Remove from heat and serve. Yes, I am making kale yet again, we all love it. 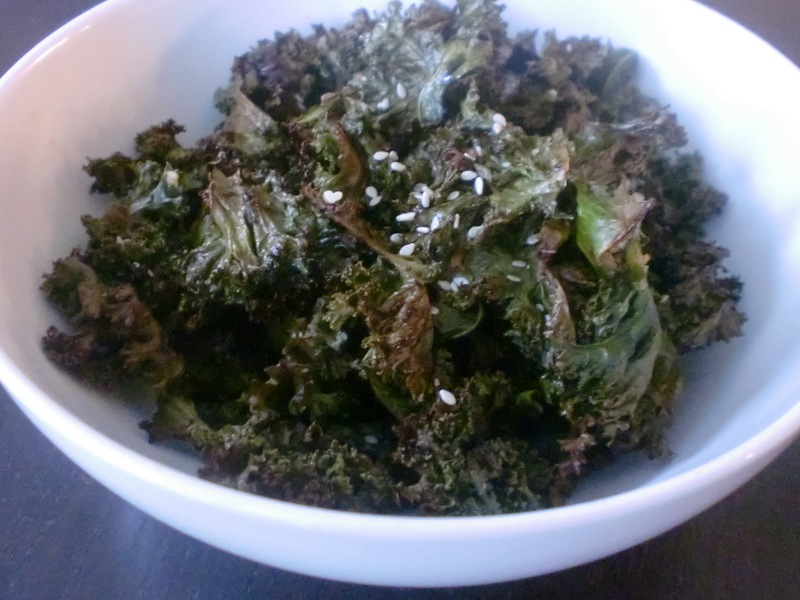 In a large bowl toss together the kale, sesame oil, garlic, soy sauce, white pepper, and salt. Bake for 15 minutes, or just until the edges begin to brown. Be sure to watch to make sure it doesn't get over done. I cut a few vegetables, break up an argument, cut a little bit more, put one boy in a time out. Then a few minutes later I am cooking with a monkey on my leg. All the while I am constantly being asked for drink refills, snacks, and being asked to find lost bear bears. As I stir what is on the stove, one boy gets a boo boo and needs a kiss. Next, both boys have dragged kitchen chairs up to the countertop to "help". This is what typically goes on. This is what makes it fun, but challenging. How do I it? I am not even really sure sometimes. My passion for cooking drives me, and there is nothing better than eating delicious meals surrounded by my family at the dinner table. I made the chicken fried rice last night, with a couple of modifications because I had leftover rotisserie chicken that was begging to be made into chicken fried rice. I also got confused re: the rice itself, because the recipe lists uncooked rice but I couldn't figure out in the recipe as printed how the rice will cook, so I ended up using cooked rice. I read somewhere on a different site that the best rice to use is cold cooked rice (perfect for leftovers!!! ), just FYI. It was sooo yummy and my kids loved it too!!! Soooo glad I was introduced to this site!! Yes indeed.... this is the type of info I was looking for! ;) Thank you!